Fujifilm had an objective. 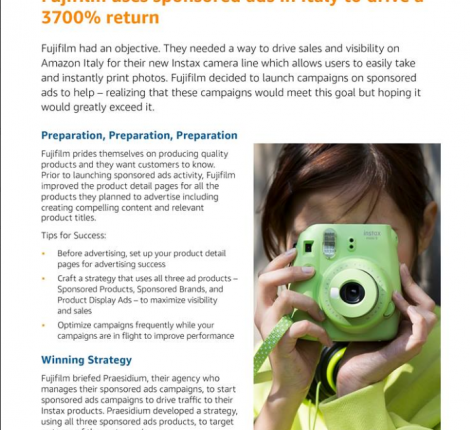 They needed a way to drive sales and visibility on Amazon Italy for their new Instax camera line which allows users to easily take and instantly print photos. Fujifilm decided to launch campaigns on sponsored ads to help- realizing that these campaigns would meet this goal but hoping it would greatly exceed it. 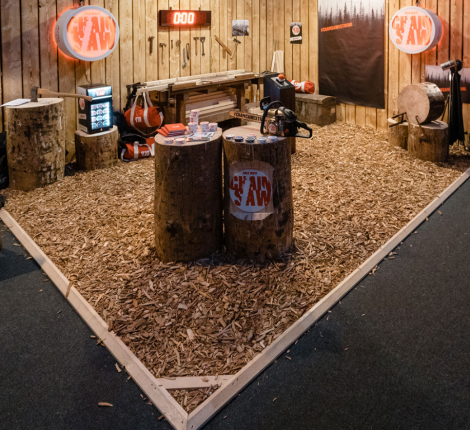 Fujifil prides themselves on producing quality products and they want cutomers to know. 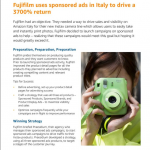 Prior to launching sponsored ads activity, Fujifilm improved the products detail pages for all the products they planned to advertise including creating compelling content and relevant product titles. Before advertising, set up your product detail pages for advertising success. 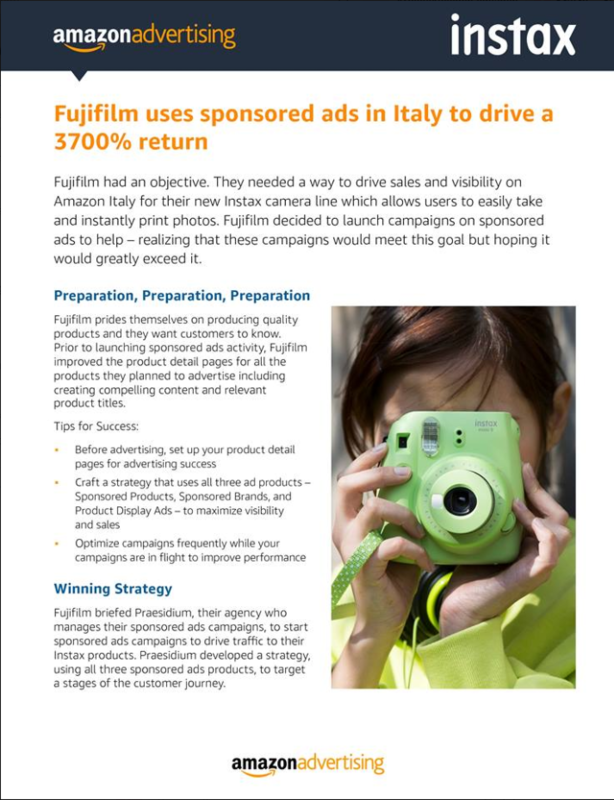 Fujifilm briefed SSI Italy (Praesidium), their agency who manages their sponsored ads campaigns, to start sponsored ads campaigns to drive traffic to their Instax products. 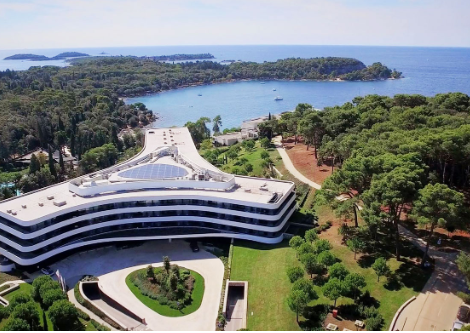 SSI Italy (Praesidium) developed a strategy, using all three sponsored adsproducts, to target astages of the customer journey. Sponsored Brands were created to increase brand awareness of Instax models by targeting relevant keywords that drove shoppers to an Amazon store featuring a range of Instax products. SSI Italy (Praesidium) creaed an Amazon store to convey the brand image and values to customers on Amazon. As Enrico Babucci, President of SSI Italy (Praesidium) , said ” Amazon stores is an important tool that has allowed us to tell the brands story, convey the product experience, and make cross-selling easier. 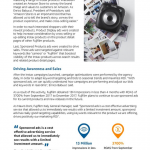 In order to reach interessted shoppers with their newest products, Product display ads were created to help increase consideration by cross-selling or up-selling Instax products on the product detail pages of other Fujifilm products. Last, Sponsored products ads were created to drive sales. These ads were targeted against relevant keywords like”camera” or “Fujifilm” that boosted visibility of the Instax products across search results and related product detail pages. After the Instax campaigns launched, campaign optimizations were performed by the agency daily, in order to adapt keyword targeting and bids to seasonal trends and maximize ROI. ” With sponsored ads, we can quickly understand how campaigns are performing and adjust our bids and keywords in real-time” Enrico Babucci said. As a result of this activity, Fujifilm obtained 13M impressions i less than 4 month with ROAS of 3700% from September 2017 to December 2017. Fujifilm plans to continue to use sponsored ads for its current products and new releases in the future.